Game of Trains is a small format card game which has been described by more than one gamer in my group as “Ticket to Rack-O”. 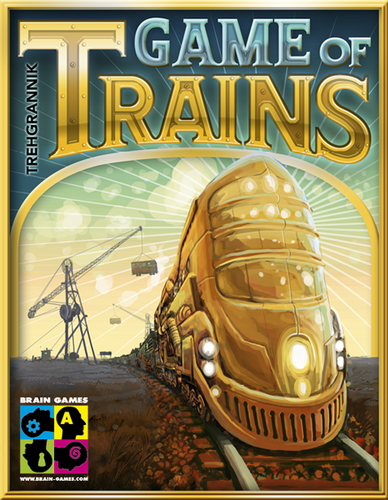 In this game, players each start with a locomotive card. 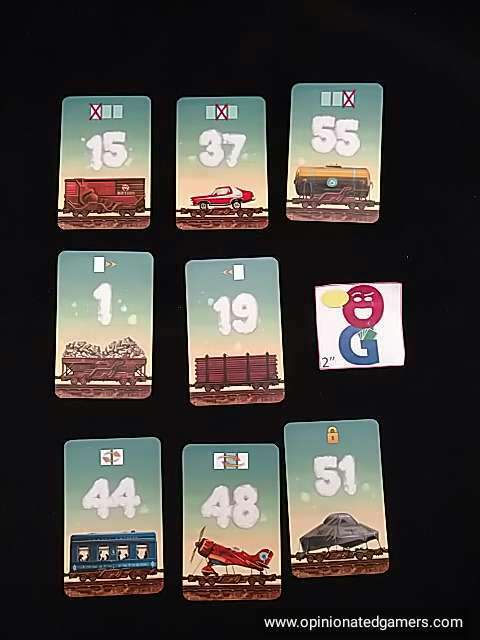 Each player is dealt 7 railcar cards (from a deck of 84 numbered cards), and at the start of the game, these cards are placed in descending order behind the locomotive card. The goal in the game is to change or rearrange the railcars so that they are in ascending numerical order. The first player to achieve this will win the game. At the start of the game, each player is given a few cards for their first play. Starting with the first player, you choose one of the cards from your initial hand and replace one of the initial seven cards that you were dealt. The new card is placed in the same position in the train as the card it replaced; that card is placed face up in the central area on the table (this may cause some cards to be discarded – more on this later). If there are any cards left in hand after this initial play, these cards are discarded face down into the discard pile. Each of the cards has two functions. The majority of the card is dominated by the number of the card; again, there are cards numbered from 1 to 84 in the deck. Above the number is the special ability of the card. There are eight different varieties of abilities. On a turn, a player takes a single action from two possible choices: Draw a card or use an ability. When a player Draws a card, he takes the top card from the discard pile. He is only interested in the number of the drawn card. The drawn card is placed in any of the seven locations in your train. The card which was previously in that space is placed face up in the center of the table. You should look at the other cards in that area; if there are ever two cards with the same special ability at the top of the card, then that pair of cards is discarded facedown into the discard pile. When a player uses a card’s ability, he chooses one of the faceup cards from the center of the table, discards it, and then executes the ability shown at the top of that card. There are eight different actions. Two let you swap cards with each other. Two let you move a railcar two spaces to the left or right. There are a set of three cards which cause all players to discard the leftmost, the rightmost or the central card in their train. All players then (in turn order) draw a random card from the deck to put in its place. 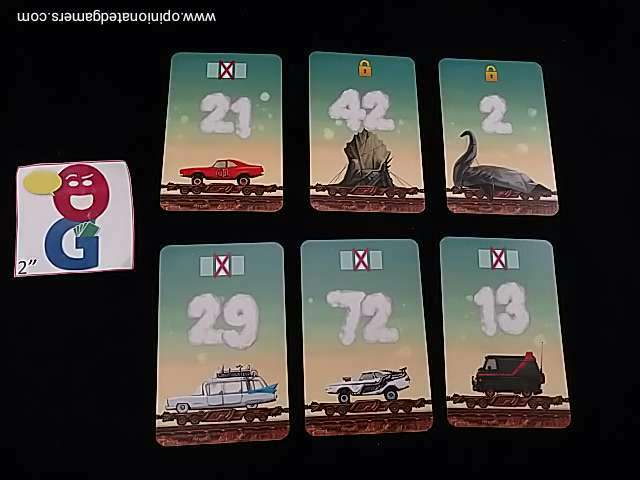 Finally, the last action card is a protector – it can be played underneath a car in your train and this will protect it from the discard actions just mentioned. 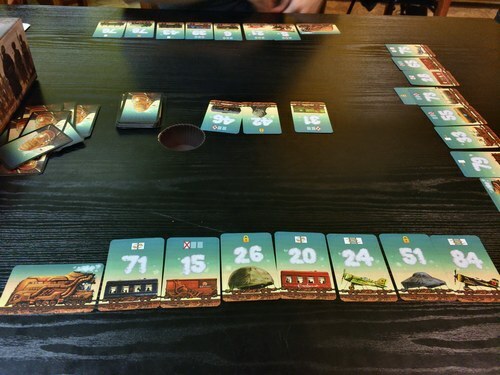 The game ends immediately when a player has their seven railcars in opposite order from the start – that is the cards are now in ascending order from the locomotive. Game of Trains is a game that balances out strategic planning with some good old luck-of-the-draw. Everyone starts out in a similar situation – though the gaps in between the cards you’re initially dealt may give you a little bit more wiggle room. For the most part, your play focuses on improving your own train, though the cards that cause all players to discard cards can be an effective attack against your opponents. The game moves along quickly as each player turn really doesn’t take very long – If you decide to draw a card, the decision of where to put it is generally straightforward (as your goal, like everyone else, is to have a line of ascending valued cards). If you choose an action, there are usually between 2 to 4 cards available at any given time, so the choice there often doesn’t take long either. I’d say most of our games take about 15 minutes now – and it’s a nice choice for a filler. The artwork in the game is well done. Many of the railcars are pop culture references, and we had a good time trying to guess what all the cars represented. Otherwise, the numbers are large and easy to read from across the table, and the iconography for the special actions is clear. Do you get the references? I had apparently missed this one when it first came out (BGG has it listed in 2015), but it appears to be making another run at the market. There are a number of companies which also co-produce the game now, so this is one that you’ll probably start seeing a bit more. As it stands, it’s a nice addition to the filler category in my game collection. Greg S.: I have only played this once so far, and was rather disappointed. I enjoy the use of the Rack-O mechanism in the 10 Days series, but found that the cards that interfere with the players in this game to cause too much chaos.